Abe Abouhamdan, chairman of the Oconee County Citizen Advisory Committee on Land Use and Transportation Planning, has submitted the application to rezone property currently owned by Gary and Linda Carroll of Eastpoint, Fla. The 5.1 acres are tucked behind a smaller parcel immediately in the corner of Daniells Bridge Road and Mars Hill Road, across Daniells Bridge Road from QuikTrip. Athens dentist Dr. James J. McDonald Jr. has indicated he plans to build an office building on that 1.6 acre parcel, which includes roadway abandoned when the intersection was upgraded several years ago. The land is owned by Paul A. Keller. Abouhamdan, in his narrative filed with the rezone application, does not indicate how the proposed building or buildings will be used. He says the request is for a “shopping center/retail/general and medical offices, etc.” with the use being consistent with the requested B-1 zone. The concept plan shows a single building, though the narrative only says the space will not be more than 22,000 square feet. Abouhamdan operates Abe Consulting, with offices at 2410 Hog Mountain Road. 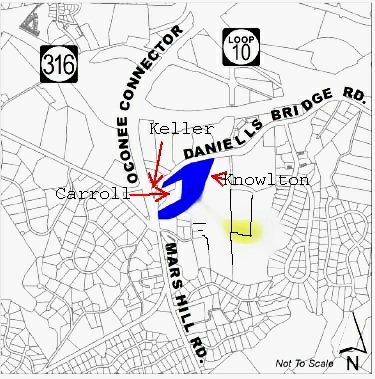 The Carrolls filed suit against the county back in the 1990s when the county built what is now the Oconee Connector, which runs from the intersection of Daniells Bridge Road and Mars Hill Road to SR 316. The Carrolls said the county unfairly denied them access to the Oconee Connector. Prior to the construction of the Oconee Connector, they had access to Daniells Bridge Road before it intersected with Mars Hill Road. But that section of Daniells Bridge Road was closed to make the new, square intersection of Daniells Bridge Road with the Connector. As part of a settlement of that suit, the Carroll property, the Knowlton property and the Keller property all will share access to Mars Hill Road. That “stub” is shown on the concept plan submitted by Abouhamdan for the rezone request. The Knowlton Estate agreed to provide land for that “stub” only on condition that the county grant variances to buffer requirements between the Knowlton property and neighboring property. The Board of Commissioners agreed to that request on Dec. 6 of last year. The second entrance to the business proposed by Abouhamdan would be across an easement on another leg of the Knowlton property. That easement would provide access to Daniells Bridge Road. At present, the property is zoned for agriculture and residential use. According to the application materials, a single family home and related structures sit on the property at present. The building has been used as rental property, the document states. According to the tax records, the Carroll property is made up of two tracts with a combined assessed value $228,798. According to the rezone application, the proposed project has an estimated value of between $3.6 and $4 million. Brad Callender, Oconee County planner, told me that the only plans that have been submitted to the county for the Keller property to date are for grading. The Planning Commission is scheduled to review the Abouhamdan application at its meeting on Oct. 15. The rezone request is scheduled to be before the Board of Commissioners at its Nov. 6 meeting. Both meetings start at 7 p.m. at the courthouse in Watkinsville. I am inclined to think that with so many office and retail spaces lying vacant within a one mile radius of this proposal that we have quite enough of that already. Urban sprawl is not good. Look what happened to Gwinnett County.